I’ve seen them fly over my house plenty of times. It’s so often that I can now tell them by the sound of their engines. But never did I think I’d be in one or see what I did! One of the Royal Australian Airforce’s newest assets and one of its most important is the KC-30A MRTT (Multi Role Tanker Transport). Based on the successful airliner, the Airbus A330, the tanker is most obviously different by the refuelling points on its wings and under its tail. While the boom (the tail mounted one) isn’t yet operational, the wing mounted pods are and have been refuelling F/A-18A Hornets for around a year. Oh and it’s also painted grey. As part of the Australian International Airshow, the RAAF decided to introduce this aircraft to the general public and I was fortunate enough to be included as part of the roughly 30 media on the flight. This flight was the first flight in the world to have no defence industry or military personnel on board. We were shown through the aircraft before the flight and invited into the cockpit as well. It’s just like a standard A330 glass cockpit only it has an extra console behind the pilots where the refuelling is done. The main cabin of the KC-30A is just like a civilian aircraft with the only notable difference the safety instructions which have “RAAF” branding all over them. We were due to board around midday with the flight departing Avalon around 1:30pm. We headed out over Victoria and at about 15,000ft, the baskets popped out the pods. The Captain told us what was about to happen. Two Hornets would close on us on the left hand side. The KC-30A crew would give them permission to fuel and one would slide to the right hand side while the other remained on the left. I was on the right side. A few minutes later I could see the nose of a hornet starting to move up to the basket. I had always dreamt of seeing a fighter jet in its element and now at last here it was. The Hornet plugged in and there was a general media scramble for great pictures. The fighter transferred its fuel and was joined by the second one a few minutes later. We continued along like this for a few minutes before they finished refuelling and flew in formation on the tanker. Wow, what a sight! The Hornets then broke away and were waiting for us when we finally re-landed. Refuelling isn’t all this versatile aircraft can do. It can carry 270 passengers and serve as an airborne medical centre. It carries 139,000 litres of fuel just like a standard A330. It was an amazing flight and I feel ver privileged to have been invited on this special event to welcome the KC-30A. A huge thank you to the RAAF, the crew and Eamon Hamilton – Public Affairs for the RAAF Air Lift Group. RAAF E-7A AEW&C Wedgetail A30-004, a photo by CanvasWings on Flickr. 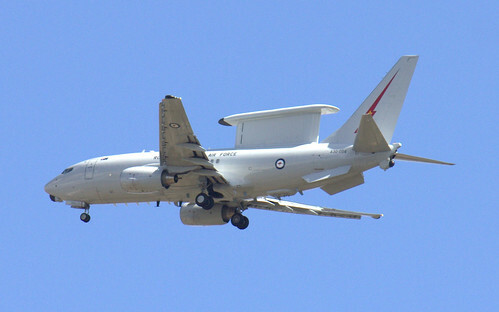 One of the RAAF’s latest acquisitions, the Boeing 737 based aircraft is currently the world’s leading AEW&C aircraft. This year will be the types second visit to the Australian International Airshow held at Avalon every two years.